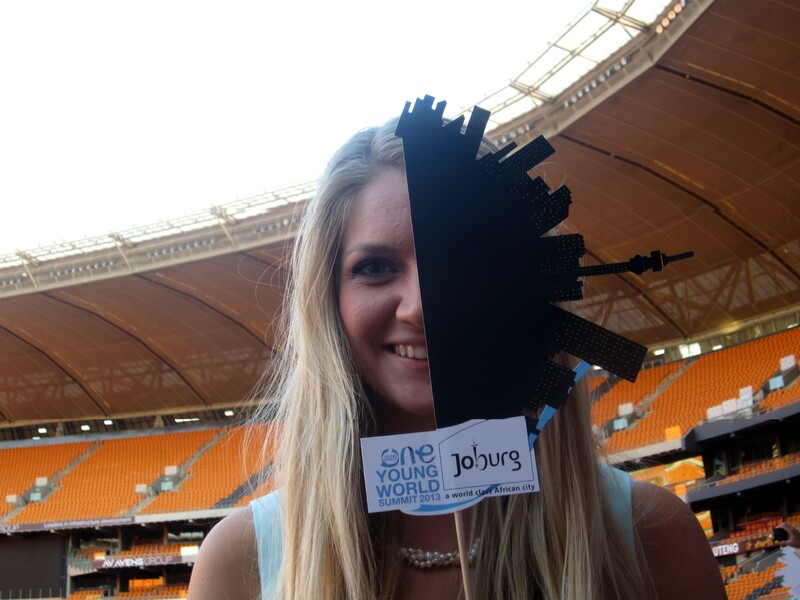 After our flight landed in Johannesburg on Wednesday 2nd October it was time for this year’s summit to kick off. 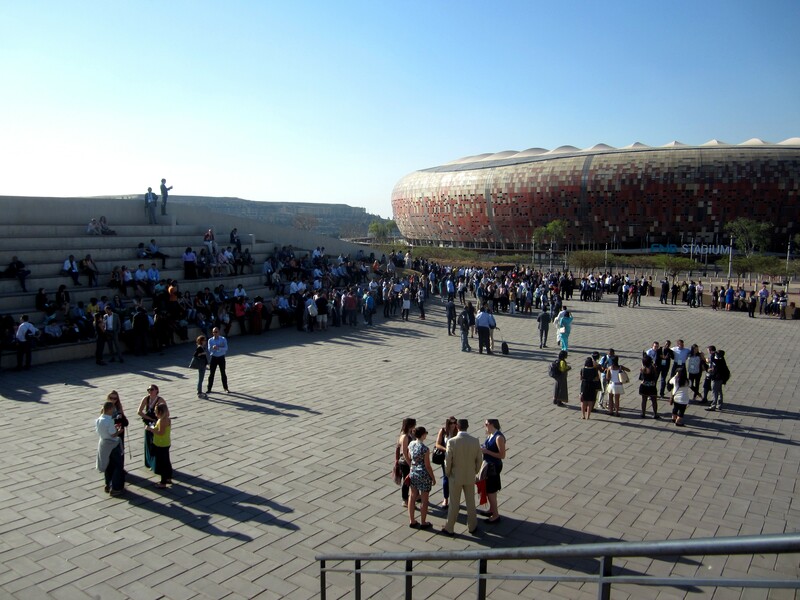 1,300 delegates headed outside of the city to Soccor City, which was to host the Opening Ceremony. 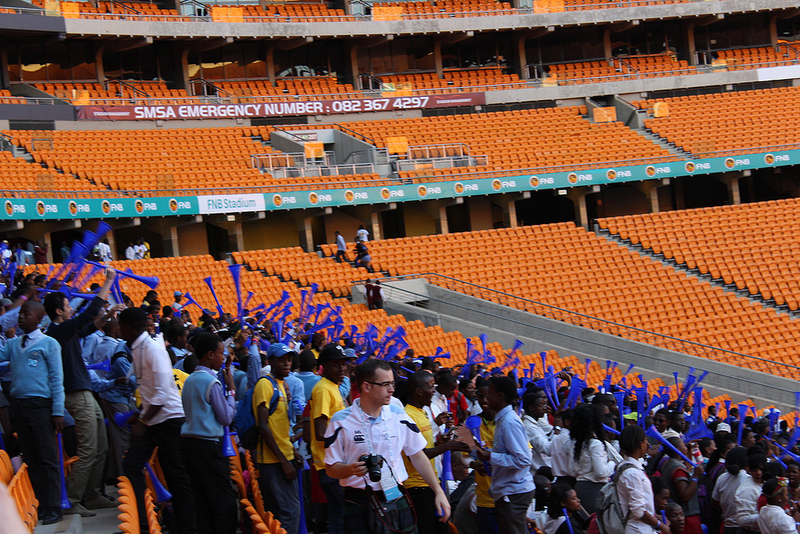 Inside we were greeted by hundreds upon hundreds of local school children from Soweto armed of course with their vuvuzelas. The crowd danced, chanted and finally when Kate Robertson and David Jones reached the stage, they introduced this year’s counsellors, a.k.a. 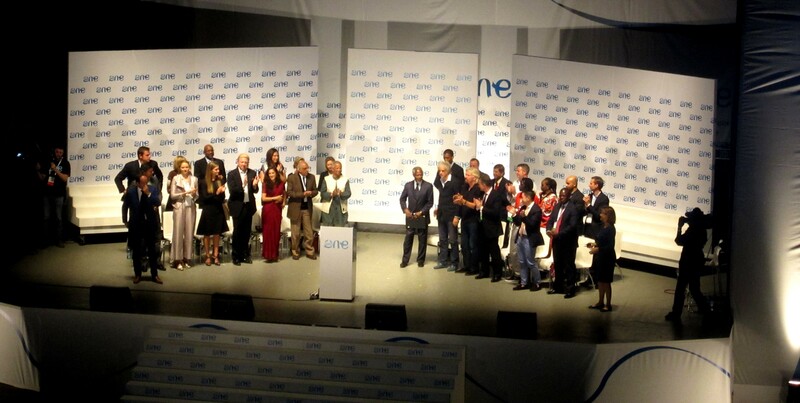 the world experts with whom we’ll be discussing global issues over the coming days. Among the counsellors are: Ahmed Kathrada (one of Nelson Mandela’s fellow prisoners), Fatima Bhutto, Muhammad Yunus, Bob Geldof, Richard Branson, Arianna Huffington and Kofi Annan. Furthermore there are important figures from the world of sport and fashion, such as Boris Becker, Francois Pienaar and Lily Cole. The Mayor of Johannesburg welcomed us to the city as well as a number of other figures and NGOs based here in Joburg. 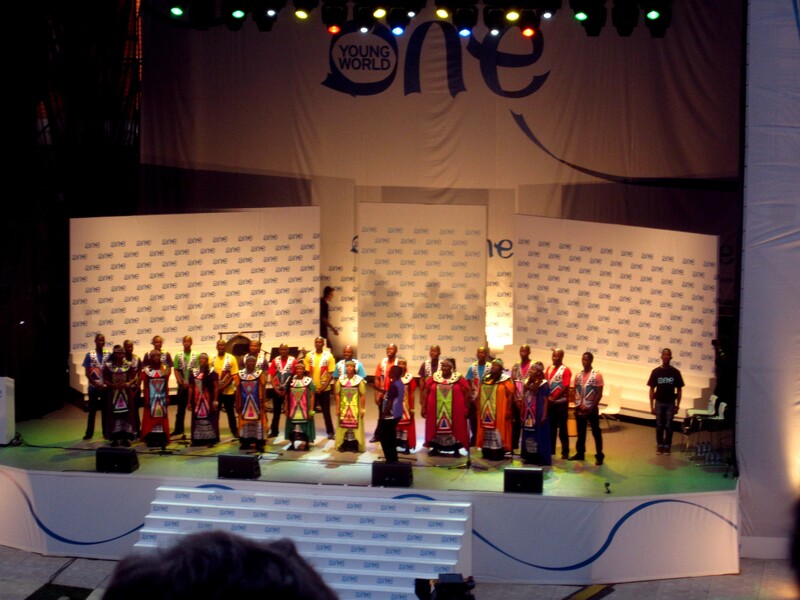 As dusk fell we were treated to various other guest speakers and even a performance by Lira, a South African singer. 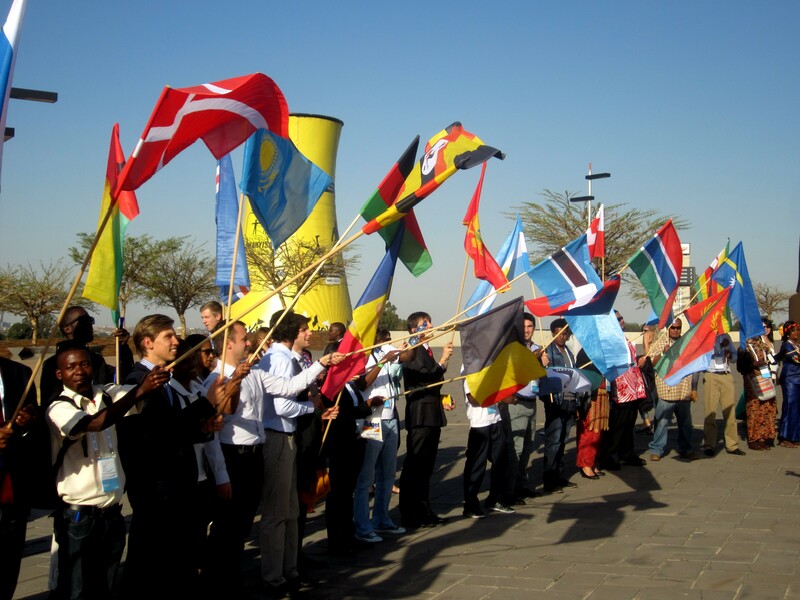 One oft-used phrase in connection with One Young World is the fact that the summit unites more countries in the world than any other event except the Olympics. 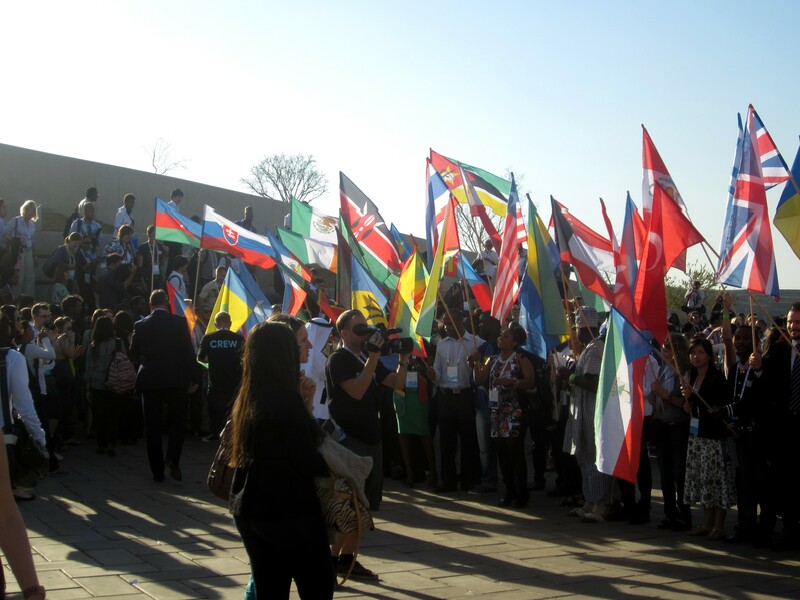 So, in true Olympian style, we had a flag bearing ceremony to exhibit the 190 countries that are present here in Johannesburg for OYW. 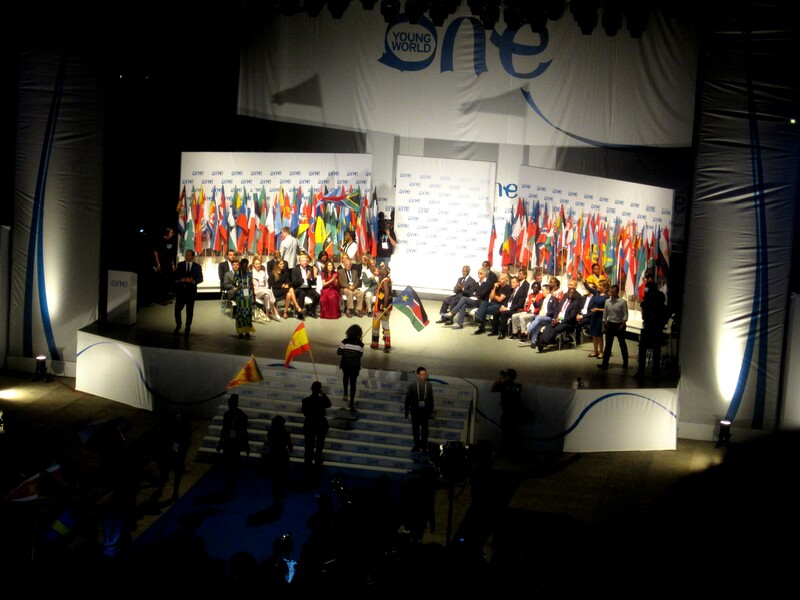 Once each flag had been presented it was time for the flag that unites all 1,300 of us at this summit: an enormous blue and white OYW flag that passed over the top of the crowd, held up by each and every one of the delegates, symbolising the network of support we each are now part of. With the formalities over, the ceremony transformed into an opportunity to talk to anyone, to meet new people from all over the world, to discover like-minded people who all hold social good as a core value and who hold the quest for solutions to our global issues as a life goal. 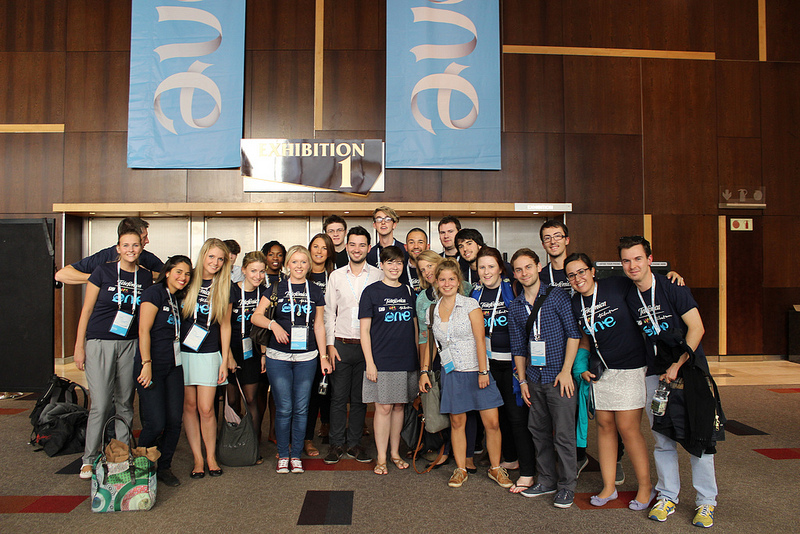 Not only are we all focussed on making a difference in the world, but we’ve all had the good fortune to be here because someone in our home countries has recognised our potential as young leaders and believes in us enough to sponsor us to be here in Johannesburg as OYW delegates, to see what we can collectively achieve. This exceptional group is made up of social entrepreneurs, founders of NGOs and not-for-profits, young leaders in businesses, universities and large corporations, all aged under 30. Each and every one of our sponsors realises that our generation will be leading the world within a few short years, and they’ve realised that it’s our generation who will have to sort out the mess that we’ve inherited from the generation before us. I am truly impressed by the achievements of everyone I have met here so far on the first evening, and what resonates most is how much everyone ha achieved at so young an age. We do not have to wait years to gain enough experience and influence to make a positive difference in the world – we have the ability to have an immediate impact and that’s why we’re all here. 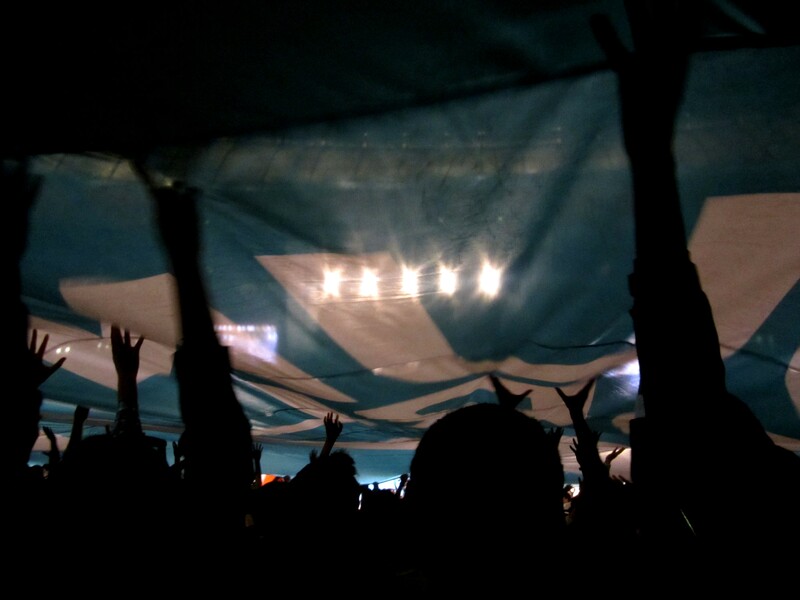 The atmosphere last night was positively buzzing – coming from such an unfriendly and anonymous city as London, where strangers don’t dare converse, it was thrilling to learn so much about the people I’ve encountered. 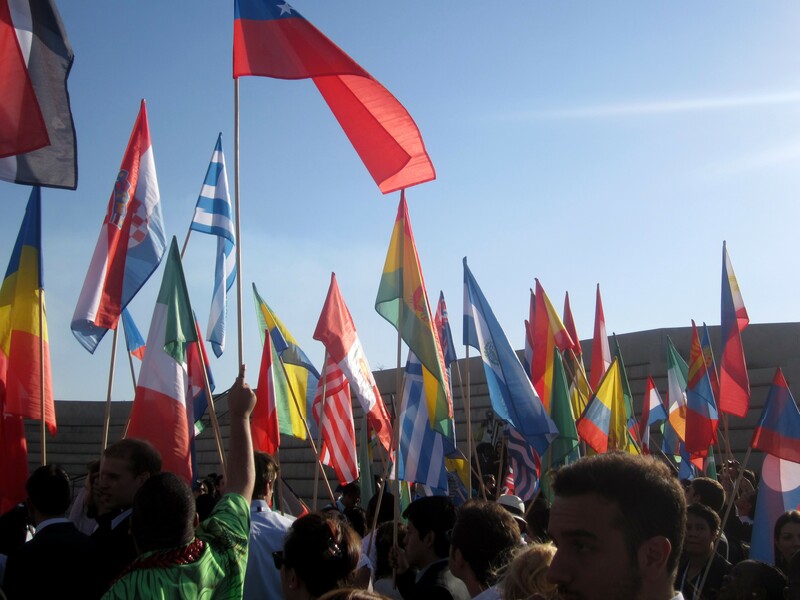 The enthusiasm for the summit to begin was clearly evident and I’m ecstatic to be surrounded by such a great bunch of young leaders from literally every country in the world.